bDepartment of Radiology (D.S. ), Lenox Hill Hospital, Northwell Health, New York, New York. SUMMARY: The sinonasal tract is an environment diverse with neoplasia. Given the continued discovery of entities generally specific to the sinonasal tract, the fourth edition of the World Health Organization Classification of Head and Neck Tumors was released in 2017. It describes 3 new, well-defined entities and several less-defined, emerging entities. The new entities are seromucinous hamartomas, nuclear protein in testis carcinomas, and biphenotypic sinonasal sarcomas. Emerging entities include human papillomavirus–related sinonasal carcinomas, SWI/SNF-related matrix-associated actin-dependent regulator of chromatin subfamily B member 1–deficient sinonasal carcinomas, renal cell-like adenocarcinomas, and chondromesenchymal hamartomas. The literature thus far largely focuses on the pathology of these entities. Our goal in this report was to familiarize radiologists with these new diagnoses and to provide available information regarding their imaging appearances. To date, the literature regarding these updates largely concerns the histopathologic features.2,4,5 A radiologist may see these rare entities reported as pathologic diagnoses, and some familiarity with the nomenclature, pathology, and imaging features is important. This article aims to briefly review the histopathologic classifications of sinonasal tumors as well as provide imaging examples and reported imaging characteristics of these new and emerging entities. While there are no true pathognomonic imaging features and biopsy remains the criterion standard, there are findings that may be useful to characterize these lesions. Accurate interpretation of sinonasal tumor imaging by neuroradiologists necessitates a fundamental understanding of the histologic subtypes. Basic classification groups include squamous cell carcinomas (SCCs), adenocarcinomas, sarcomatous/mesenchymal tumors, neuroectodermal tumors, salivary neoplasms, papillomas, respiratory epithelial lesions, hematolymphoid tumors, and tumor-like entities (On-line Table). REAHs are well-defined, near muscle density, and homogeneous on CT. The olfactory cleft is often expanded and smoothly remodeled without erosive changes.18 REAHs are heterogeneous on T2WI and isointense on T1WI relative to the cortex and enhance uniformly (Fig 1).21 To our knowledge, no substantial dedicated literature regarding the appearance of SHs on imaging exists to date. Published CT images in the pathology literature show an appearance similar to that of REAH.20 MR images of a proved SH published here show similar signal on T2WI and enhancement patterns (Fig 2). On the sagittal images, both often have a characteristic half-moon appearance when situated in the olfactory cleft, here described as a “crescent sign” (Fig 3). REAH. A, Coronal noncontrast CT shows mildly expansile soft tissue in the bilateral olfactory clefts without adjacent bony erosion or destruction (white arrows). Coronal T2 fat-saturated (B) and coronal T1 postcontrast, fat-saturated (C) MR images in the same patient show the lesions to be heterogeneous and hyperintense to the cortex on T2WI and enhancing. SH. A, Coronal noncontrast CT shows expansile soft tissue in the left olfactory recess extending inferiorly into the superior nasal cavity (white arrows) without erosive or destructive bony changes, similar to an REAH. Axial T1 precontrast (B) and axial T1 postcontrast, fat-saturated (C) images demonstrate predominantly homogeneous enhancement. The relatively hyperintense, nonenhancing central component on T1WI suggests proteinaceous content (white arrowheads), possibly reflecting glandular secretions. Areas of relative central hyperintense signal on precontrast T1WI are not described in other published examples. Crescent sign. A, Sagittal T1 postcontrast MR image of an REAH. B, Sagittal noncontrast CT image of a seromucinous hamartoma demonstrates a characteristic half-moon morphology (white arrowheads), which we have termed a “crescent sign” when the lesions arise in the olfactory recess. Differentiating REAH from SH is not possible by imaging alone. The presence of frank bony erosion or skull base defects would favor encephalocele, carcinoma, or esthesioneuroblastoma (other soft-tissue lesions typical of the olfactory cleft) over REAH, SH, or benign inflammatory polyp.22 The “crescent sign” morphology on sagittal images, in our experience, is suggestive of REAH and SH within the olfactory cleft. NUT carcinoma. 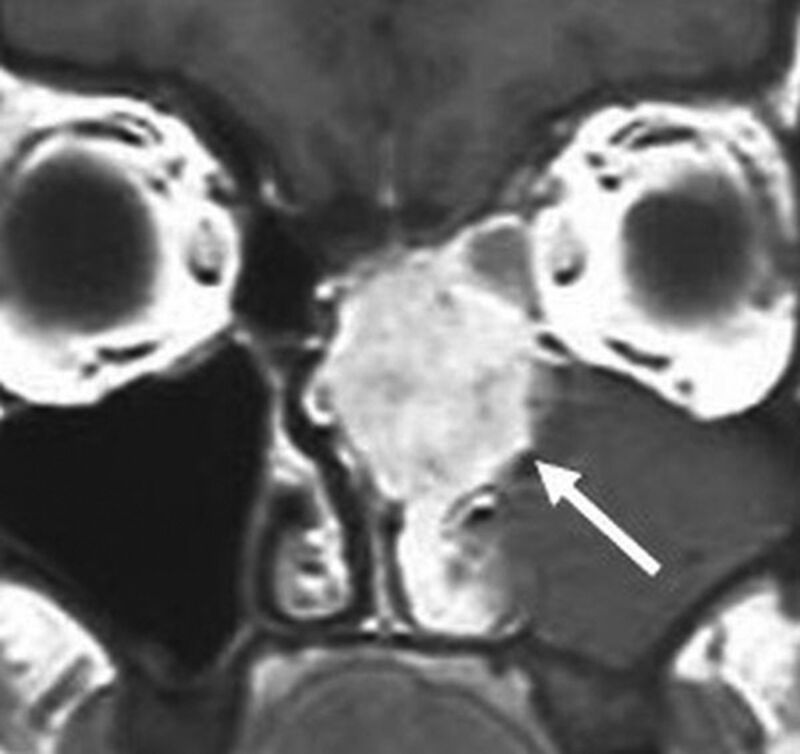 A, Axial noncontrast CT image shows a locally destructive mass centered within the left ethmoid sinus extending into the left orbit and laterally displacing the medial rectus muscle. There is faint mineralization within the mass (white arrowheads). Axial T2 fat-saturated (B) and coronal T1 postcontrast, fat-saturated (C) MR images from the same patient show the mass to be heterogeneous but predominantly hypointense to the cortex on T2WI and avidly enhancing. The mass extends into the anterior cranial fossa with dural involvement (white arrows). Images are courtesy of Dr Nafi Aygun, Johns Hopkins Hospital. The masses are well-marginated but locally aggressive and can erode through the skull base or into the orbit. Associated hyperostotic bone formation is described on CT.35,40 The masses avidly enhance and are isointense-to-hypointense to the cortex on T2WI (Fig 5). Biphenotypic sinonasal sarcoma. 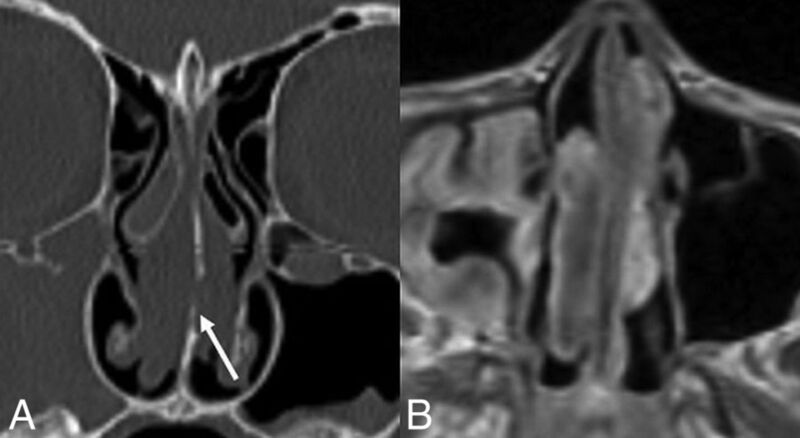 Coronal T2 (A) and axial T1 postcontrast, fat-saturated (B) MR images show a well-marginated but locally aggressive right nasoethmoid mass involving the right maxillary sinus. The mass extends through the right lamina papyracea to involve the right orbit (black arrowheads) and through the right lateral lamella and fovea ethmoidalis into the right anterior cranial fossa (white arrow). Heterogeneous but predominantly isointense signal relative to the cortex on T2WI and avid contrast enhancement are noted. Little is published on the imaging findings of HPV-related sinonasal carcinomas as a group. Pathology-proved cases here published are similar to those of other sinonasal SCCs destroying, remodeling, and/or invading bone. They have variable signal relative to the cortex on T2WI and enhance on MR imaging (Figs 6 and 7). The multiphenotypic variant case shown here was FDG-avid. HPV-related sinonasal carcinoma, a nonmultiphenotypic variant. 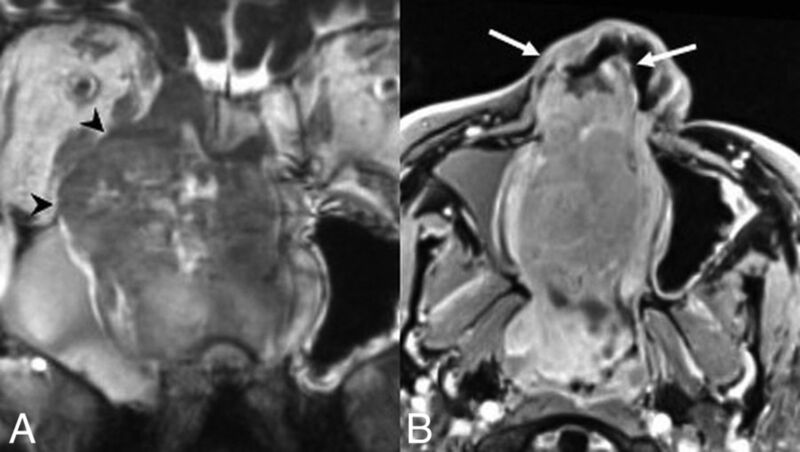 Coronal T2 (A) and axial T1 postcontrast, fat-saturated (B) MR images show a right nasoethmoid mass with extension to the right maxillary sinus and orbit (black arrowheads) as well as the left nasal cavity. There is anterior extension into the right nasal vestibule (white arrows). The mass demonstrates heterogeneous hyperintensity relative to the cortex on T2WI and avidly enhances. Images are courtesy of Dr Nafi Aygun, Johns Hopkins Hospital. HPV-related multiphenotypic sinonasal carcinoma. 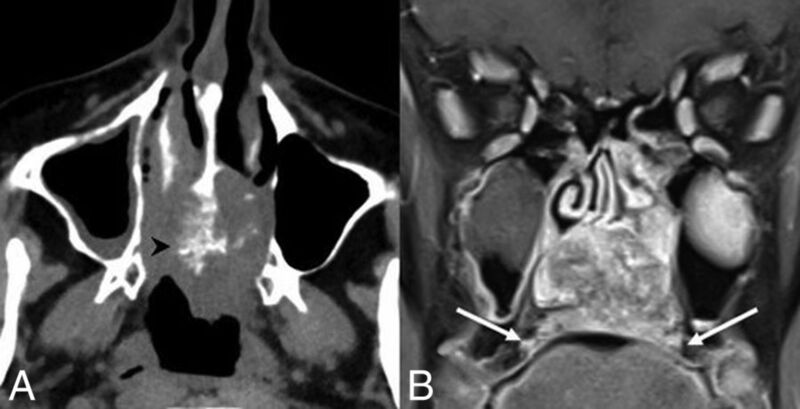 Axial noncontrast CT (A) and coronal T1 postcontrast, fat-saturated (B) MR images show an aggressive mass centered in the inferior nasal cavity. The mass is isodense to muscle with an aggressive periosteal reaction along the nasal septum (black arrowhead). The mass is enhancing and locally destructive, invading the marrow of the hard palate (white arrows). SMARCB1-deficient sinonasal carcinomas are composed of mitotically active epithelioid nests with basaloid features and necrosis similar to SNUC and nonkeratinizing SCC.44⇓–46 Given this histologic overlap, SMARCB1-deficient sinonasal carcinomas may represent a distinct entity or a histologic pattern seen in various other tumors.11,47 Diagnosis is by immunohistochemical analysis demonstrating complete loss of SMARCB1 expression, a tumor-suppressor gene implicated in several tumors with rhabdoid features.44,45,47,48 SMARCB1-deficient sinonasal carcinoma is an emerging entity currently classified as a SNUC subtype. SMARCB1-deficient sinonasal carcinoma. A, Coronal noncontrast CT shows the “hair on end” pattern of calcification/periosteal reaction (white arrows) described in several published cases. 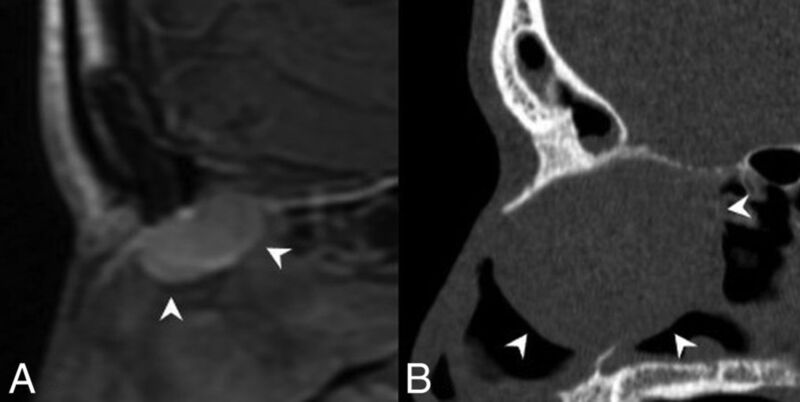 Coronal postcontrast CT (B) and coronal T1 postcontrast, fat-saturated (C) MR images in a second patient demonstrate an enhancing nasoethmoid mass eroding the floor of the anterior cranial fossa (black arrows). There is also erosion of the right lamina papyracea with extraconal orbital extension. A secondary mucocele extends through the left orbital roof (white arrowhead). Within the broad differential for locally aggressive sinonasal tumors, including SNUC and other carcinomas, SMARCB1-deficient sinonasal carcinoma diagnosis is dependent on tissue sampling. Calcifications are a commonly found imaging feature. Published cases show expansile, locally destructive masses with intracranial extension and dural involvement described. On MR imaging, the tumors are heterogeneous to the cortex on T2WI and enhance avidly, similar to renal cell carcinoma.54⇓–56 A key diagnostic criterion is the lack of a concomitant suspicious renal mass (Fig 9). Renal cell-like adenocarcinoma. Coronal T1 postcontrast MR image shows an avidly enhancing, locally destructive, left nasoethmoid mass. The pronounced enhancement is akin to that of a renal cell carcinoma metastasis (white arrow). Images are courtesy of Dr Margie Brandwein, Mount Sinai Hospital. There are no pathognomonic imaging findings, and the differential is broad, including other aggressive primary and secondary lesions. The absence of a concomitant renal mass is key to diagnosing renal cell-like adenocarcinoma when tissue sampling is suggestive. Chrondromesenchymal hamartoma. A, Coronal noncontrast CT in a pediatric patient shows polypoid soft tissue in the bilateral nasal cavities with mild erosive changes focally along the left margin of the nasal septum (white arrow). B, Axial T1 postcontrast, fat-saturated MR image demonstrates heterogeneous enhancement. No cystic or calcified components, frequently described in these lesions, are seen in this case. Images are courtesy of Dr Nafi Aygun, Johns Hopkins Hospital. Overlapping imaging findings with other expansile benign-appearing pathology make chondromesenchymal hamartoma a histologic diagnosis but it should be considered in a mixed cystic and calcified sinonasal mass in a child. In the olfactory cleft, REAH and SH often take on the herein described “crescent sign” morphology on sagittal images. Otherwise, these new and emerging entities have similar, locally destructive appearances on imaging. Certain entities have more typical features, such as calcifications with SMARCB1-deficient sinonasal carcinomas and cystic and calcified components in chondromesenchymal hamartomas, but no pathognomonic findings exist. These entities are rare, many exceedingly so, and should generally not be standard in a typical sinonasal mass differential. However, familiarity with these diagnoses is warranted. As more imaging examples of these entities are analyzed, further clarification of any specific imaging characteristics may be useful in refining these differentials. We would like to thank Dr Nafi Aygun, Johns Hopkins Hospital; Dr Caroline Robson, Boston Children's Hospital; Dr Christine Glastonbury, University of California, San Francisco; and Dr Margaret Brandwein-Weber, Mount Sinai Hospital, for providing excellent sample images. Accepted after revision December 20, 2018.